Chelsea forward Juan Cuadrado has completed his move to Juventus on a season-long loan, seven months after leaving Florentina for Chelsea in last January. The 27-year-old Colombia forward's loan move has been confirmed by both clubs. Speaking to the club’s official website, Cuadrado said: “We all know that Juve is a great club, among the best teams in Europe. They have everything to win the Scudetto. I hope I can give Juventus my best, 100%. 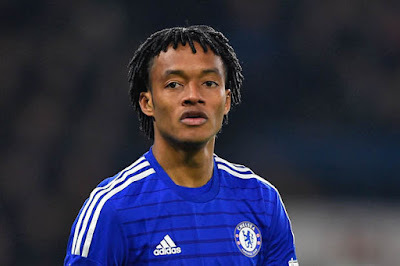 Cuadrado was one of Colombia’s star players at last year’s World Cup but has failed to make an impact at Stamford Bridge since moving from Fiorentina for an initial £23.3million. He signed a four-and-a-half year contract at Chelsea but it seems the club are already willing to allow him to play elsewhere after four Premier League starts. Speculations are rift France midfielder Paul Pogba will make the switch in the opposite direction, with a transfer fee of £60m been muted. The Chelsea manager José Mourinho refused to discuss Pogba last Friday and the Cuadrado switch appears independent of any negotiations for the former Manchester United midfielder.